Over forty-five million people of Hispanic descent make the United States their home. One out of eight Americans uses such labels as hispano, Latino, tejano, Chicano, mexicano, Nuyorican, Cuban, nuevomexicano, salvadoreño, colombiano, dominicano, and more to indicate to their Spanish-speaking heritage in Latin America or the United States. Front-page news proclaims Hispanics the largest minority group and the fastest-growing segment of the population, having more than doubled since 1989 and accounting for half the total population growth in the United States since 2001. Concurrently, the twenty-first century has seen an explosion of Latino music, usually called música latina in the windows and bins of record stores and on the banners of digital music retailers. The creation of the Latin Grammys in 2000 marked the new, permanent, prominence of Latin music in the United States. It also reflected the rise of a "parallel universe"—a Spanish-language music industry, that taps the soaring buying power of U.S. Latinos, projected to surpass one trillion dollars annually in 2011. As Spanish-language television and radio grow, música latina grows with it. Concerts by superstars such as Los Tigres del Norte, Shakira, Juanes, Gloria Estefan, and Julio Iglesias attract tens of thousands of fans. Latino music and media exert a powerful influence on American life, and their presence is growing. But beyond the glitzy veil of pop culture lies something much grander—dozens of musical styles from many cultures; music played for religious ceremonies, in the privacy of homes, at birthdays, weddings, and on Latin American independence days; music that speaks to the changing panorama of American life. A research and documentation project launched by Smithsonian Folkways and the Center for Folklife and Cultural Heritage in 2001 explored grassroots música latina's many dimensions and shades of meaning. This project has generated thirty compact disc recordings, dozens of video interviews with artists, four Smithsonian Folklife Festival "living exhibitions" under the umbrella titled of Nuestra Música: Music in Latino Culture, and the online Música del Pueblo: A Smithsonian Virtual Exhibition. The recordings, produced from 2003 to 2009 as a series named Tradiciones/Traditions were selected to showcase signature Latino musical traditions performed by top-notch artists in their respective genres. The 2009 Smithsonian Folklife Festival program, called Las Américas: Un Mundo Musical/The Americas: A Musical World, explores the fruits of this series. Each of these productions promotes the idea that for many Latinos, music is much more than just music—it is a vehicle of collective memory, a "flag of identity" in a multicultural nation, a buttress of cultural defense, a force for social cohesion, and an instrument of transformation and progress. The compact disc recording Heroes and Horses: Corridos from the Arizona-Sonora Borderlands features narrative ballad (corrido) singers who carry on a tradition of creating "musical monuments" to a shared past that is vital to Mexicans living in a politically divided region. The corrido, however, is more about the future than the past. Although it draws from memories of heroes, triumphs, and tragedies, it is also a means of strengthening a community’s resolve in forging its own future. Another recording, A Tribute to Gonzalo Asencio "Tío Tom," is itself a musical monument to the legendary but unsung hero of Cuban rumba, the street musician known as Tío Tom. The late Orlando "Puntilla" Ríos leads the all-star band Conjunto Todo Rumbero in breathing new life into Tío Tom's classic guaguancó rumba compositions and adding a fresh columbia rumba piece in praise of Asencio and his legacy. Juan Gutiérrez remembers arriving in New York City from Puerto Rico in the 1970s and experiencing "the longing that one has for the Puerto Rican, for connecting with one's own. I started to look for people in the barrio, and that's where I found myself, thank God." He immersed himself in the Afro-Puerto Rican musics known as bomba and plena—starting the Nuyorican (New York Puerto Rican) ensemble Los Pleneros de la 21, teaching, performing, organizing community musical events, and co-producing the GRAMMY-nominated album Los Pleneros de la 21: Para Todos Ustedes (For All of You). He also performs on another Smithsonian Folkways release, Viento de Agua Unplugged: Materia Prima (Raw Material). Singer-songwriter Suni Paz expresses the "flag of identity" theme in her album Bandera Mía: Songs of Argentina, interpreting a panorama of regional songs as well as her own piece, "Bandera Mía" (My Flag). She sees the album as a public statement of the range and beauty of Argentine cultural heritage, similar to the character of many others in the Tradiciones/Traditions series. Karol Aurora de Jesús Reyes feels the same way about her Puerto Rican música jíbara, heard on Jíbaro Hasta el Hueso: Mountain Music of Puerto Rico by Ecos de Borinquen: "It's the music of my country, that which represents us and that which identifies us as a people." For many, their music is a way to fend off cultural extinction. "The importance of our marimba is that it reflects our identity, what we Guatemalans are," says marimba musician Erik Armando Vargas, featured on Chapinlandia: Marimba Music of Guatemala. The marimba is the official national instrument of his country, and Vargas sees it as a line of defense against an invasion of foreign pop culture. He teaches his daughters to play, so that "in any given moment, they can defend what is Guatemalan." Another marimba tradition, this one rooted in the Afro-descendant community of Colombia's Pacific coast, has been a source of cultural defense and social cohesion in the face of decades of civil unrest and violence linked to the drug trade. The marimba de chonta (marimba made from palm wood) with its accompanying drum ensemble and line of female vocalists has, since the late 1990s, emerged from being a receding vestige of the past to a vibrant symbol of regional pride and identity. ¡Arriba Suena Marimba! Currulao Marimba Music from Colombia features Grupo Naidy, one of the sparks of this cultural resurgence. In El Salvador, the civil war of the 1980s and 1990s left 75,000 people dead and massive social dislocation. Over a million Salvadorans fled to the United States, including rural violinist Trinidad Lovo: "We come from sadness, from war that makes nobody want to dance, to be joyous. . . . Through music, you can get beyond sadness, beyond whatever problems you have with your job, any sort of problem." In his new home in the Washington, D.C. area, Lovo has helped revive his family chanchona—a generations-old kind of musical group from his region of eastern El Salvador. Los Hermanos Lovo (The Lovo Brothers), with two violins, guitar, percussion, and chanchona (string bass), performs regularly for Salvadoran gatherings, reintegrating Salvadoran social life by providing a sense of "home" through their familiar music. Ironically, traditional music is often an agent of social progress and transformation. Rolas de Aztlán: Songs of the Chicano Movement showcases music that was an instrument of the Mexican American civil rights movement that emerged in the 1960s from farm workers' struggle for just pay and decent working conditions. Included on the album is the nascent group Los Lobos del Este de Los Ángeles (later known simply as Los Lobos), reminding us of their rootedness in the Chicano social struggle. The Chicano movement also gave new meaning to Mexican mariachi music in the United States, as young people flocked to the music that expressed their cultural heritage. Nati Cano, leader of Los Angeles-based Mariachi Los Camperos, has for nearly fifty years strived to change the barroom image of the music through musical discipline, creativity, and prestigious concert settings such as Lincoln Center in New York City and Washington, D.C.'s Kennedy Center. His award-winning albums, including Amor, Dolor y Lágrimas: Música Ranchera, ¡Llegaron Los Camperos! Concert Favorites of Nati Cano's Mariachi Los Camperos, and ¡Viva el Mariachi!, have further served his cause of elevating the social image of his music. Yet another musical means for social change was Chilean nueva canción (new song) that emerged in the 1960s, engaging tradition as a means of drawing attention to the beauty of rural traditions and the social needs of the people who practiced them. Rafael Manríquez, speaking of his recording ¡Que Viva el Canto! Songs of Chile, underscores the notion that tradition must keep pace with social evolution: "Folklore is not a museum piece; folklore is something that is alive." Today, decades after the Chilean leftist movement was halted by the 1973 military takeover, Manríquez sees traditional music in the modern urban environment as a vehicle to weave Chile's cultural past into a meaningful cultural future for the good of Chilean society. In another vein of cultural progress and transformation, women have claimed new roles in musical traditions previously reserved for men. Colombian singer Ana Veydó of Grupo Cimarrón sings the rough-edged, male-dominated joropo recio of música llanera found among the ranching people of the Orinoco plains in Colombia and Venezuela. Her singing on Sí, Soy Llanero: Joropo Music of the Orinoco Plains of Colombia is a social statement as well as aesthetic, showing that women are every bit as worthy as men in singing the genre. In the mountainous Cibao region of the Dominican Republic, the accordionist known as La India Canela is on a similar track, as heard on La India Canela: Merengue Típico from the Dominican Republic. Following in the footsteps of pioneering female accordionist/singer Fefita La Grande, La India Canela advocates both for her merengue típico tradition at large and for its openness to female lead performers. "It has been a great satisfaction that some of the young women have come up to me and said that they have seen in me an example to follow," she says. Música latina is an expanding universe of styles and social meaning. New styles of music are created alongside older styles that remain. As the Latino world becomes more urban, more globalized, and saturated with popular media and profit-driven products, community-driven music often moves to the stage setting and gains a heightened role as art form, cultural icon, and social rallying force. Age-old music acquires newly constructed meanings at the same time that new creations take on the mantle of old functions. In the competitive and specialized modern context, instrumental virtuosity is on the rise, and many local traditions fade away in the shadows of social change. Music, as a form of heightened communication, lies at the forefront of cultural life; and traditional music, laden with its seasoned cultural values and its associations with an entire way of life, becomes a charged symbol of statehood, a means of social self-reliance, and a "cultural territory" of elevated consciousness. In times of wrenching social change, musical tradition evolves in order to stay "traditional" and to remain a fully functioning part of community life. As agents of innovation and continuity, traditional musicians are rooted in the past, but look to the future—the future of their music and the future of their people. Article adapted and revised from Daniel Sheehy, "Nuestra Música: Music in Latino Culture," in Smithsonian Folklife Festival, (Washington, D.C.: Smithsonian Institution, 2004), pp. 38-47. 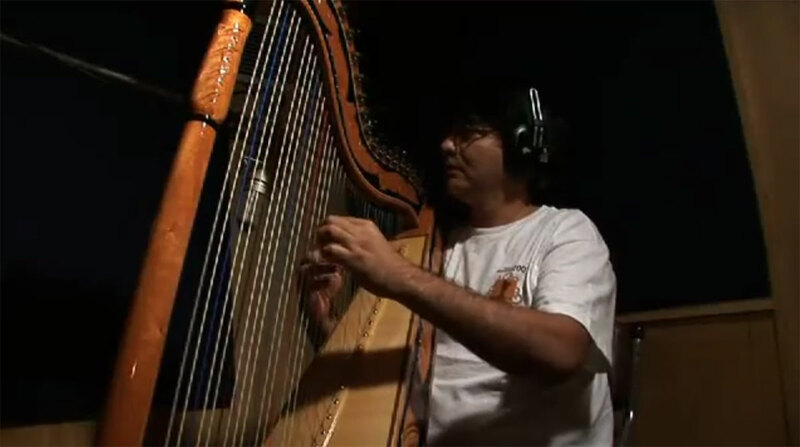 Harpists Martin Portillo and Marcelo Rojas join guitarist Alfredo Gryciuk and bassist Ariel Burgos in a "dueling harp" rendition of the classic polca "Pájaro campana".